What do you want first: the good news or the bad? Personally, I always choose to hear the bad news first. That way I can end on a good note. I know that chimpanzees share 97% of their DNA with humans and are therefore intelligent enough to learn languages and adapt to situations, but the fact that the chimps here can speak so much English--with proper grammar at that!--is questionable considering their lack of contact with humans for the past 10 years. And if they can all sign, why would they suddenly begin speaking aloud to each other? That's like going into a foreign community in which people can speak a bit of English and hear them speaking it to each other in their discussions when it makes absolutely no sense to do so. Unless, of course, you have an audience watching and you're trying to impress upon them that chimps are like, so similar to humans. Oh, and it's totally believable they ride horses! And fire guns! Because you know, if your entire stance as an ape is to resist the human way of life, naturally you'd do basically everything they do. There is, as I said at the beginning, good news as well. The reason I watched this movie at all--an Oscar nomination for Best Visual Effects--is well deserved. Not only have the artists created realistic looking chimps, the gorillas are amazing and Maurice, the orangutan, is my absolute favorite. As a matter of fact, the facial expressions on the apes are so good they actually overshadow the actors (though really, that's not that hard. Jason Clarke? Really?) The action is also pretty good. Fights between chimps are way better than people because apparently the way chimps kill things is just to bang down on their chests with their fists. And the whole "simian flu" epidemic plot point felt current because of our recent Ebola obsession and now the Measles outbreak. Plagues decimating a population will never get old. That's why Outbreak was an awesome movie. Final word: If Pocahontas and The Lion King were action films. 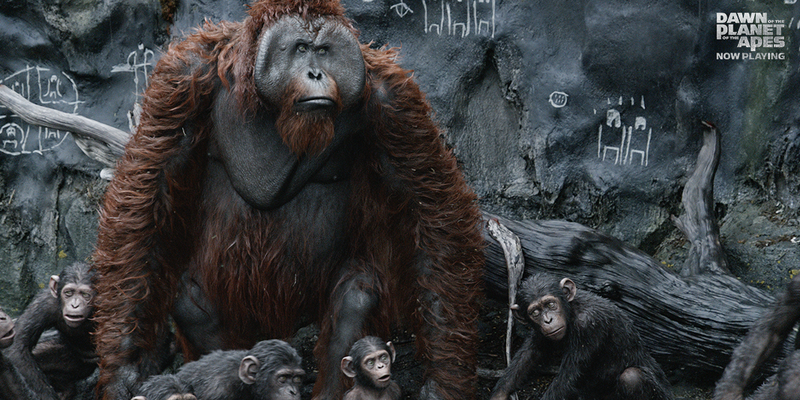 But with really awesome apes.